“Patients need to make important decisions and there is a big need to promote education,” Dr. Morphin said. 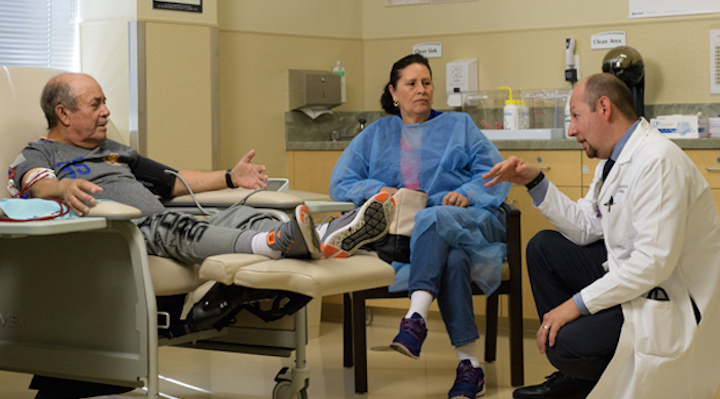 There’s virtually no discussion and little room for patient education on the range of treatment options, although it’s clear doctors, themselves, would choose a different modality other than in-center 3-times-a -week dialysis. Optimal Transitions™ seeks to change outcomes by giving patients the education they need about their health and their choices for treatment. In the course of the four-week Optimal Transitions, program, patients receive dialysis five days a week in the center setting, but using the home hemodialysis machine. A Satellite “CREW” – nurses, technicians, social workers, dieticians and the medical director – works with the patient to understand their lifestyle and their goals. The patient’s family is involved in developing a treatment plan. Week 1: The first week is familiarization and the second is devoted to education and evaluation. Week 3: The third week involves patient training, home setup and any surgery needed for port access. Week 4: The final week is focused on making the transition. “The biggest opportunity is with patients in the first 90 days of care,” Dr. Morfin said. “There is always fear at the decision point,” he said. “But with education, patients can feel comfortable with their choices. Click here (http://www.nephtalk.org/nephtalk-magazine/2017/october/optimal-transitions-trade-/) to learn more about Satellite Healthcare Optimal Transitions.